In Iran, cancers are considered as the third cause of mortality with cardiovascular diseases and accidents are the first cause. The mortality from myocardial infarction in patients with and without diabetes is high in Iran., Pattern of cancer incidence is different in various population and is associated with such factors as occupational, social, cultural, ethical, and geographical issues, custom, and nutrition. Epidemiologic studies such as time-trend analysis of disease incidence in different parts of the world lead to the emergence of differences and similarities resulted from comparing their results. Consequently, observation of differences obtains a proof for findings its causes and Due to lack of information about cancer in the geographical area. Knowledge of various cancers in any particular geographical area can help planning the health services for patients and screening the high-risk group of that area. Cancer registration and time-trend analysis is a management tool for measuring the cancer incidence in a specific population over a period of time, so that the effect of cancer can be evaluated and controlled in the community. Economic, social, and demographic changes throughout the years in Iran have yielded significant changes in the patterns and trends of cancer. Up to now, no valid report of the trends of cancers has been presented in Chaharmahal and Bakhtiari (Ch and B) province in Southwestern Iran. This is the first study which has been designed and aimed at investigating the trend of cancer incidence in this province. This study was secondary data analysis and done based on existing data that were conducted using all data of pathology-based cancer incidence (2003–2016) in Ch and B province in Southwestern Iran. These data were collected retrospectively reviewing all new cancer patients registered in Cancer Registry Center by Health Deputy of Shahrekord University of Medical Sciences (SKUMS) and covers >95%. The target population included all patients with cancer having definite pathology sample of cancer. Data based on a definitive pathologic diagnosis of cancer registry were collected from various resources including clinics, laboratories, and centers of histology and cytology throughout the province, the hospitals, death certificates, and forensic offices. Cancer diagnosis has been based on pathology laboratory and book coding International Classification of Disease (ICD)-O2 and ICD. Assume i = 1, 2, n is independent variable that can indicate the process of death or incidence and can be a crude numerical value, modified amount, or the age. Moreover, i = 1, 2, n is the time variable whose trend we want to study. Where (β0, β0, δk,......δk) are the parameters of the regression model. Equation (1) shows the joinpoint regression model. This formula consists of the width from the origin and the regression coefficients. k indicates the number of unknown points, ti for i = 1....., k represents the locations of the unknown change points, and are the regression coefficients of the fragments. Equation (2) shows the regression coefficients of the fragments, where represents the joinpoint. Equation (4) shows the APC (yt) calculated by Equation (1). When there is a trend distance, P ≤ 0.05. This study did not have any particular moral constraint. Researcher studied the registered statistics observing all ethics in research and without any intervention. Confidentiality and integrity were considered in all phases of the study and all stages of the work were done with the permission of SKUMS. This study showed out of 2918 new cases of cancers occurred in Ch and B in 2010–2014; 1183 cases were female (40.54%) and 1735 (59.46%) were male. Annual incidence of all cancers was 68.2/100,000 population in 2010–2014, so that it was 38.5 and 26.2/100,000 population in male and female, respectively. Trend of incidence of the stomach, breast, colorectal, thyroid, lymph node, and ovarian cancer was rising. In 2014, the observed incidence ratios of common cancers, including stomach, breast, colorectal, thyroid, lymph nodes, ovaries, and bladder, were 0.11, 0.12, 0.09, 0.06, 0.02, 0.03, and 0.08, respectively. 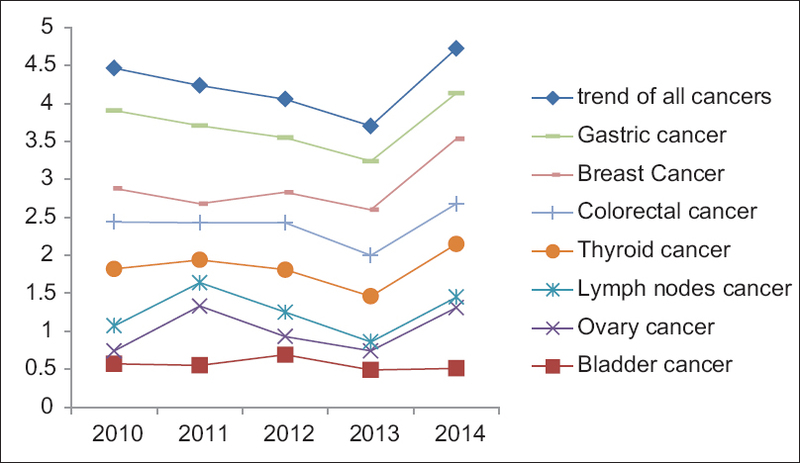 Overall observed trend and common cancers are given in [Figure 2] for Ch and B in 2010–2014. 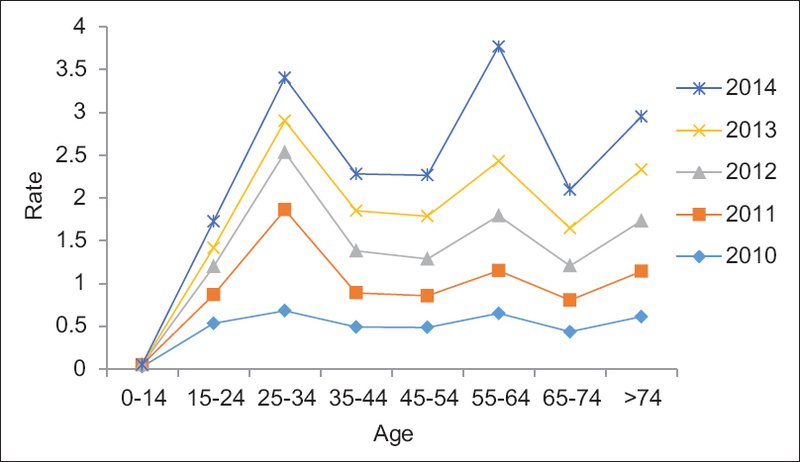 The highest incidence in term of age group was in 25–34 and 55–64 years. The incidence trend of observed cancers in Ch and B province by age group in 2010 and 2014 is shown in [Figure 3]. According to obtained results, time trend of all cancer incidences in Ch and B in Southwest of Iran has an increasing trend. Pattern of incidence of various cancers was different in the various populations and is related to such factors as occupational, social, cultural, ethical, and geographical issues, custom, and nutrition. The average annual incidence of cancer in Ch and B province was 70.41/100,000 people, less than the average annual incidence of cancer in Iran and the world. According to the official report of Iran population-based cancer registry, the annual incidence of cancer in Iran was reported to be 158/100,000 people (including skin cancer) and 143,000 people (regardless of skin cancer). Furthermore, the average annual incidence of cancer (regardless of skin cancer) in the world based on the World Cancer Registry Report in five continents is 182/100,000 people. Annual incidence of all cancers was more in males than females in Ch and B. In terms of gender pattern, it is consistent to with statistics 2012 GLOBOCAN, but in terms of quantitative comparison, however, the incidence of cancer in the province of Ch and B was less than that of the GLOBOCAN statistics, so that ASR of cancer incidence in developing countries for males was 163 and >135.8% for women. In 2016, compared to the base year (2003), the incidence of cancers in Ch and B province was more than triple and a half. This statistics shows that the incidence of cancers has risen in this area. Part of the increase in early years is due to the completion of the cancer registration process and the improvement of diagnostic services and partly due to the extremely increased incidence of cancer in this geographical area. Like this study, limited studies including ones in China and Spain have been done. A study by China reported a rise in the incidence of prostate cancer in the last four decades with APCs of 2.2% (95% CI: 0.3%–4.3%), 13.2% (11.4%–15.0%), and 3.2% (−0.3%–6.8%), respectively. The mortality trend was stable before 1985 and increased slowly but steadily after 1985, with APC of −0.6% (−4.4%–3.3%) and 5.3% (4.7%–6.0%), respectively., The findings of this study were compared with other studies in other provinces of Iran including Qom. There was an increasing and significant trend, according to APCs equal to 8.08% (CI: 5.1–11.1) for all site cancer in women. Trend of all cancer incidences in Ch and B in Southwest of Iran is higher in men than women. In several studies, the incidence of cancer in men was higher than that of women. Rafiemanesh in his study showed that the trend of esophageal cancer over 6 years is higher in men than women, and the APCs was 7.9 (95% CI: 3.3–12.6) for women and 9.6 (95% CI: 6.0–13.2) for men. According to the results of this study implying an increase in the incidence of ovarian cancer in Ch and B province, Sharifian et al. in their study showed that the incidence trend and mortality of ovarian cancer has been significantly increased in Iran from 1999 to 2013. Factors such as the prevalence of unhealthy fat consumption in Iran have contributed to cancer, so that about 70% consumed fat of Iranian is saturated fat, and in the recent decades, population growth and birth rates in Iran have declined and consumption of oral contraceptives has changed, increasing the risk of ovarian cancer in Iran. Safavi et al. showed the increasing trend of incidence of thyroid cancer in Iran in 2004–2010. In comparison to the past, improvement of diagnostic technique for thyroid cancer has influenced the increase in the incidence of thyroid cancer. In accordance with our results, various studies in Iran showed the ascending trend in the incidence of breast cancer. Increasing the women's awareness and diagnostic screening tests, increasing life expectancy, and changing lifestyle in the Western style  lead to an increase in the number of patients in the recent year. The results of the study showed that the incidence of bladder cancer in Ch and B province is constant. According to various reports, the incidence of bladder cancer in Iran has an ascending trend and high provincial dispersion. Improving the cancer registration system and increasing life expectancy, lifestyle, and smoking have led to an increase in the incidence of bladder cancer in Iran. In the present study, trend of incidence of lymphoma cancer was raising. Lymphoma cancer has been increasing across the world in 2004–2008. In Yazd, Ahvaz, Isfahan, and Kerman, the most incidence of lymphoma cancer has been observed. Results of our study are consistent to that conducted in Kerman showing the increasing trend in lymphoma cancer. In the present study, increased smoking in Kerman has contributed to increase in lymphoma cancer. The result of this study showed that the incidence of cancer in Ch and B province after 65 years of age is increased. The incidence of all cancers is increased after 60 years of age. One of the reasons for the increased risk of cancer with age may be decline in mobility. This study is the first study to investigate the incidence of cancers in Ch and B in Southwest of Iran, which can serve as a reference for decision-makers in the health system and like an experimental study, can serve as a solid foundation for management and researchers in Iran. This study has some limitations. Access to all patients' data within 15 years was not possible based on the type of cancer and the clinical and paraclinical characteristics of the patients, and only some cancer information was available for the years 2010–2014, which was used. Cancer registration program of the province has many defaults; sometimes, the differences in the quality and coverage of data are observed, and in some cases, there is undercount and misclassification. Moreover, improving the cancer registration system may be one of the reasons of increasing the cancer. It seems that reviewing the existing plan and using different method for cancer registration based on population are necessary for correct estimation of cancer rate in the country. This article is the result of a research projects number 636–73-07–1390 (3008) with ethical code IR.SKUMS.REC.1393.9.25 approved by SKUMS. Thereby, the authors thank to SKUMS and Modeling in Health Research Center to support this study as well as the Health Deputy at SKUMS, especially Dr. Fadaie and Mr. Nasseri and his colleagues in cancer pathology laboratories. Shahrekord University of Medical Science and Modeling in Health Research Center, health deputy of Shahrekord University of Medical Science. The funding sources played no role in the study design, data analysis, and manuscript writing, or in the decision to submit this manuscript for publication. Asmarian N, Kavousi A, Salehi M, Mahaki B. Mapping of stomach cancer rate in Iran using area-to-area Poisson Kriging. J Health Syst Res 2012;8:681-7. Ahmadi A, Soori H, Sajjadi H. Modeling of in hospital mortality determinants in myocardial infarction patients, with and without type 2 diabetes, undergoing pharmaco-invasive strategy: The first national report using two approaches in Iran. Diabetes Res Clin Pract 2015;108:216-22. Zeinalian M, Eshaghi M, Sharbafchi MR, Naji H, Marandi SM, Asgary S, et al. A comparative study on cancer prevention principles between Iranian traditional medicine and classic medicine. Int J Prev Med 2016;7:61. Abdifard E, Ghaderi S, Hosseini S, Heidari M. Incidence trends of colorectal cancer in the West of Iran during 2000-2005. Asian Pac J Cancer Prev 2013;14:1807-11. Rohani Rasaf M, Rohani Rasaf M, Rahimi F, Mehrazma M, Golmohammadi A, Motiedoost R, et al. Distribution of cancer incidence in districts and neighbourhoods of a number of Tehran districts in 1386. Razi J Med Sci 2011;18:34-45. Forman D, Bray F, Brewster DH, Mbalawa CG, Kohler B, Piñeros M, et al. Cancer Incidence in Five Continents. Vol. 10. 2014. Available from: http://www.iarc.fr/en/publications/pdfs-online/epi/sp164/CI5volX_Full.pdf. [Last accessed on 2016 Dec 20]. Darabi M, Asadi Lari M, Motevalian SA, Motlagh A, Arsang-Jang S, Karimi Jaberi M, et al. Trends in gastrointestinal cancer incidence in Iran, 2001-2010: A joinpoint analysis. Epidemiol Health 2016;38:e2016056. Ahmadi A, Salehi F. Evaluation of observed and the expected incidence of common cancers: An experience from Southwestern of Iran, 2010-2014. J Res Med Sci 2018;23:4. Program JR. Statistical Methodology and Applications Branch, Surveillance Research Program. Bethesda, MD: National Cancer Institute; 2013. Rafiemanesh H, Maleki F, Mohammadian-Hafshejani A, Salemi M, Salehiniya H. The trend in histological changes and the incidence of esophagus cancer in Iran (2003-2008). Int J Prev Med 2016;7:31. Kim HJ, Fay MP, Feuer EJ, Midthune DN. Permutation tests for joinpoint regression with applications to cancer rates. Stat Med 2000;19:335-51. Kim HJ, Fay MP, Yu B, Barrett MJ, Feuer EJ. Comparability of segmented line regression models. Biometrics 2004;60:1005-14. National Cancer Demography Program; 2018. Available from: http://www.irancanreg.ir/. [Last accessed on 2018 Jun 28]. Qi D, Wu C, Liu F, Gu K, Shi Z, Lin X, et al. 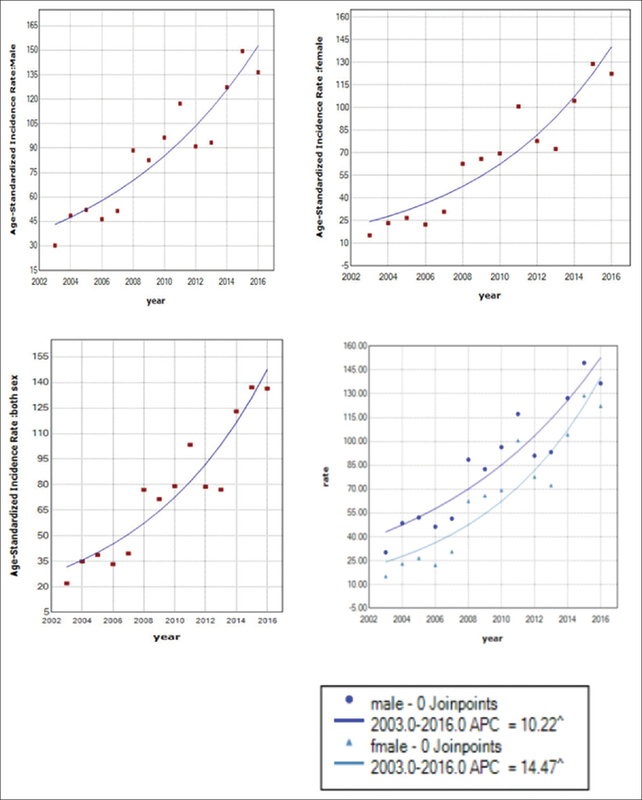 Trends of prostate cancer incidence and mortality in Shanghai, China from 1973 to 2009. Prostate 2015;75:1662-8. Bernal M, Gómez FJ, Gómez G. Trends in cancer mortality in Spain: 1975-2004. Tumori 2009;95:669-74. Rafiemanesh H, Rajaei-Behbahani N, Khani Y, Hosseini S, Pournamdar Z, Mohammadian-Hafshejani A, et al. Incidence trend and epidemiology of common cancers in the center of Iran. Glob J Health Sci 2015;8:146-55. Haidari M, Nikbakht MR, Pasdar Y, Najaf F. Trend analysis of gastric cancer incidence in Iran and its six geographical areas during 2000-2005. Asian Pac J Cancer Prev 2012;13:3335-41. Vakili M, Pirdehghan A, Adimi M, Sadeghian M, Akhondi M. Epidemiology and trend of cancer in Yazd, a central province of Iran, 2005-2009. J Res Health Sci 2014;14:210-3. Emami MH, Ataie-Khorasgani M, Jafari-Pozve N. Diagnostic value of alarm symptoms for upper GI malignancy in patients referred to GI clinic: A 7 years cross sectional study. J Res Med Sci 2017;22:76. Mousavi SM, Somi MH. Gastric cancer in Iran 1966-2006. Asian Pac J Cancer Prev 2009;10:407-12. Mirzaei H, Salehi H, Sahebkar A, Avan A, Jaafari MR, Namdar A, et al. Deciphering biological characteristics of tumorigenic subpopulations in human colorectal cancer reveals cellular plasticity. J Res Med Sci 2016;21:64. Sharifian A, Pourhoseingholi MA, Norouzinia M, Vahedi M. Ovarian cancer in Iranian women, a trend analysis of mortality and incidence. Asian Pac J Cancer Prev 2014;15:10787-90. Akbari M, Khayamzadeh M. Incidence, mortality and burden of cancers in Iran. Iran Cancer Report. 1st ed. Tehran: Cancer Research Center, Shahid Beheshti University of Medical Sciences; 2008. p. 95-125. Arab M, Khayamzadeh M, Tehranian A, Tabatabaeefar M, Hosseini M, Anbiaee R, et al. Incidence rate of ovarian cancer in Iran in comparison with developed countries. Indian J Cancer 2010;47:322-7. Safavi A, Azizi F, Jafari R, Chaibakhsh S, Safavi AA. Thyroid cancer epidemiology in Iran: A time trend study. Asian Pac J Cancer Prev 2016;17:407-12. Davies L, Welch HG. Thyroid cancer survival in the United States: Observational data from 1973 to 2005. Arch Otolaryngol Head Neck Surg 2010;136:440-4. Asadzadeh Vostakolaei F, Broeders MJ, Mousavi SM, Kiemeney LA, Verbeek AL. The effect of demographic and lifestyle changes on the burden of breast cancer in Iranian women: A projection to 2030. Breast 2013;22:277-81. Koohi F, Salehiniya H. The trend of incidence of bladder cancer in Iran, 2003-2009. J Urmia Univ Med Sci 2015;26:1-9. Eatemed K, Gooya M, Ramazani R. Iranian Annual National Cancer Registration Report. Ministry of Health and Medical Education. Center for Disease Control and Prevention; 2008. Keyghobadi N, Rafiemanesh H, Mohammadian-Hafshejani A, Enayatrad M, Salehiniya H. Epidemiology and trend of cancers in the province of Kerman: Southeast of Iran. Asian Pac J Cancer Prev 2015;16:1409-13. Jackson R. An early selective medline: Henry Stelwagon's 1916 textbook of dermatology. J Cutan Med Surg 2007;11:191-4. Hasanpour Z, Nasri H, Rafieian-Kopaei M, Ahmadi A, Baradaran A, Nasri P, et al. Paradoxical effects of atorvastatin on renal tubular cells: An experimental investigation. Iran J Kidney Dis 2015;9:215-20.